Back boiler (about the size of a shoebox). Can fetch good money at the recyclers if copper. 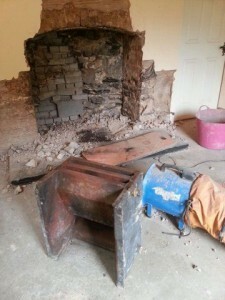 When excavating a fireplace you may be removing a back boiler. A back boiler is some kind of metal (copper or steel) vessel that holds water and is embedded within a fireplace. When “live” it is connected by two copper pipes to a cylinder upstairs. These pipes will often run up the side of a chimney breast (may be boxed in under wallpaper) but they may be embedded within a wall. In my experience 90% of all back boilers looks the same (see picture): a metal box, about the size of a shoebox connected to 22mm or 28mm copper pipes. However, a back boiler can be any shape (e.g. a matrix or fancy design). If a back boiler is present then it must be removed and disconnected from the plumbing system (or investigated to ensure it already has been). In general this is a job for a plumber. VERY IMPORTANT NOTE: NEVER DISCONNECT A BACK BOILER AND THEN SEAL OFF THE TWO PIPES EXITING THE BACK BOILER AND THEN LIGHT A FIRE. IN FACT ALWAYS REMOVE A DISCONNECTED BACK BOILER. Why? Because water (even a tiny amount) will boil and the steam will cause a huge build up of pressure (water expands 1,600 times when converted to steam) and if that pressure cannot escape then the thing explodes. This has killed people. Back boiler live or not? If you can see a back boiler then there may be evidence that it is not live (“live” meaning full of water under some kind of pressure). If there is a hole in the back boiler then there can be no water in it (if a plumber disconnects a back boiler he may drill a hole in it). If the pipes coming from the back boiler are cut then it is disconnected. If a cylinder has been removed then the back boiler almost certainly been disconnected (unless some strange plumber has linked it to a radiator or the general pipework). Note that a back boiler might be disconnected from a cylinder or circuit but still hold quite a lot of water (trapped in the pipework from upstairs). How do I remove a back boiler? I drill a small hole in the boiler (e.g. 5mm) and see if any water spurts out. If it does I use a couple of buckets to collect the water (passing full ones to my assistant to pour away). Or I use a wet vac. Usually there will be no water or just a small amount (half a bucket from the pipes being common). The 5mm hole ensures that should a mistake have been made and the system be live at least there is a chance of stopping the flow (finger over hole). My assistant did once put his SDS chisel through a back boiler pipe (he thought he was nowhere near it and was proceeding with opening up a builder’s opening whilst I investigated the plumbing). 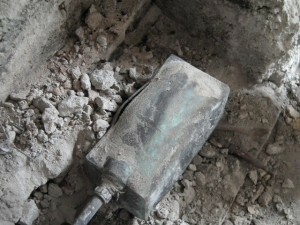 Luckily the house was being renovated (no carpets and a concrete floor) and so the resulting jet of water did no damage. We used large Gorilla buckets to collect the water although it progressively got hotter and hotter as the cylinder emptied itself from our pipe (and the gorilla buckets became rather soft and useless). Should this ever happen then all you can do is switch off the mains water and wait for the system to empty (this can be as much as a full cylinder AND a full loft header tank).